I've noticed lately that most advice from Facebook marketing blogs only applies to online businesses. The "experts" there only run pages for their online products -- social media training, blogging training, ebooks, etc. -- so when they offer marketing advice, it often doesn't apply to the real, brick-&-mortar world. This is why I try to base my advice on my experience running real-world, brick-&-mortar small biz pages on Facebook. I'm talking about small business pages that are geared toward local customers. Running a page for a local business is much different than running a Facebook page that teaches you how to market. They have different challenges -- which require different tactics & techniques. So let's talk about 7 ways you can use Facebook for local business to increase sales. Your #1 goal when posting to your page should be catching the attention of your followers & getting them to engage with your posts. If you fail at this you'll probably fail at running your page. Sure you want to market your products -- and yes, you want people to click thru to your website. The page only has about 700 Likes -- and yet, nearly 80 people Liked this post! I think any of us would take a 10% engagement rate any day! Remember -- people don't want to just be sold to all the time. They will let you sell to them it sometimes, but only after you build some rapport. Build trust with your followers & get them talking on your posts. Then, once you've built this relationship, mix in link posts to your products or website. My boss, Josh Parkinson, likes to call this techinique "chumming the waters". 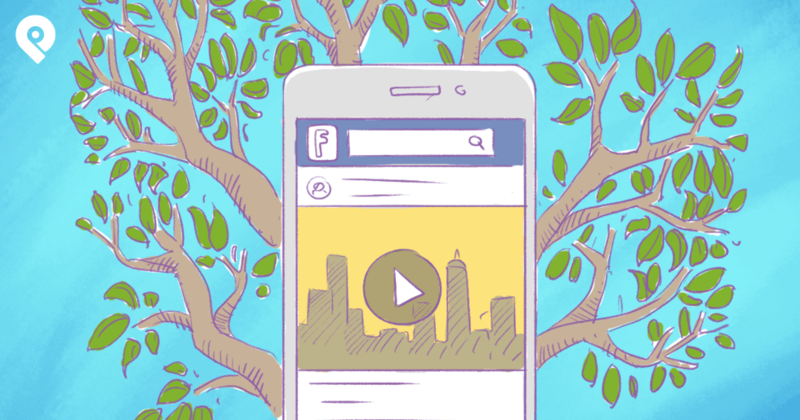 Remember -- with the way Facebook's page algorithm works, your fans only see posts from pages they engage with. For example, on Post Planner, we make sure that only 50% of our posts are links back to our blog. The other posts are created purely to get engagement from fans -- so we can make sure ALL our posts continue to show up in the news feeds of our fans. If all you post is salesy content, eventually engagement will die off -- and you'll just be talking to yourself. I'm focusing here on local, small businesses -- those that have tangible products. 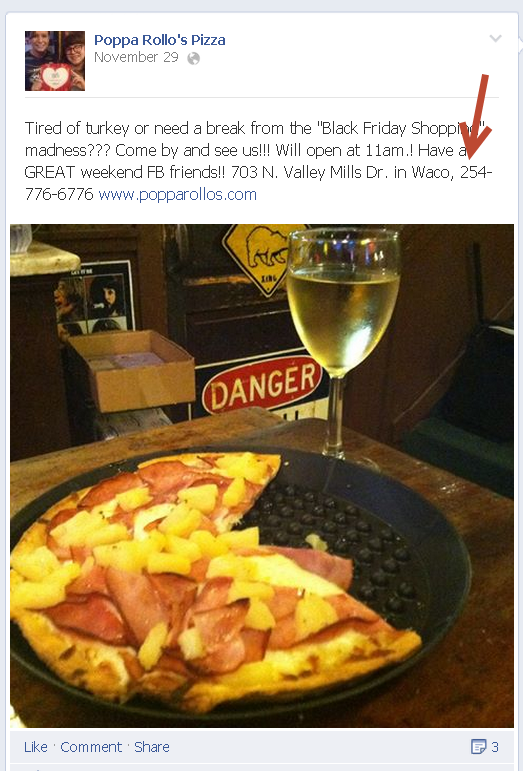 The power of suggestion is very strong on Facebook -- especially with images that ignite the senses & passions of people. With about 1,500 fans on this page, this post got more than 100 Likes -- not too shabby! I've eaten this burger -- and even though I'm vegetarian now, my mouth waters when looking at this photo! Appeal to your fans senses by showing off your products with high-quality photos. To get engagement on your posts, you have to have fans! 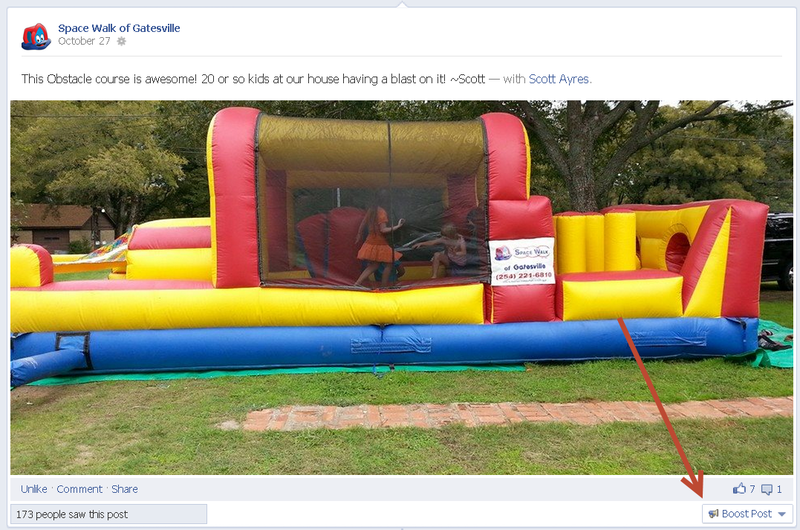 This is great, as long as your family & friends are potential customers who will engage with your posts. There is no need to have people Like the page who will never engage -- and in fact, having too many non-engaged fans will hurt your page in the long run. I have pages that I will never recommend to my friends -- because they aren't the target demographic of the page. 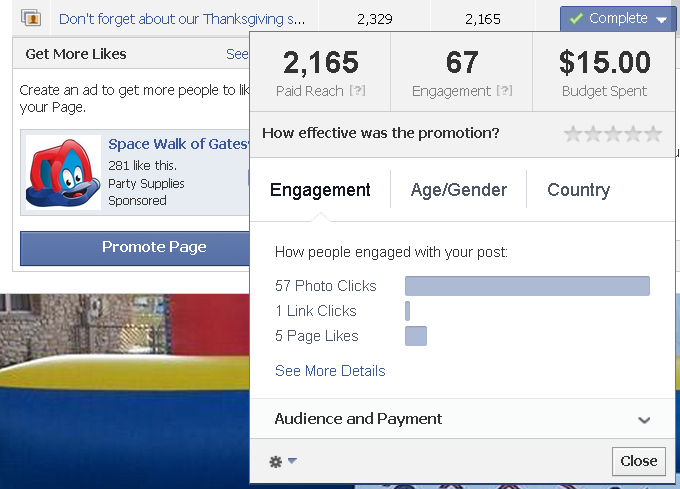 As a small, local business, the best way to get Likes is to use the Promoted Page Likes feature on your page. I've successfully used this feature on local pages & seen great results -- both an increase in Likes & sales related to those Likes. You'll find this feature just above your cover photo on the left hand side. 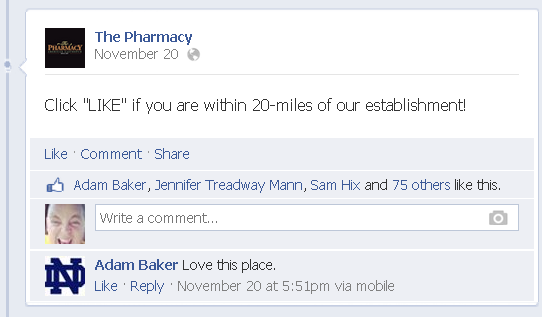 Since we're talking about local businesses, I suggest targeting an audience within 20 to 30 miles of your store. There's no need to target everyone in your state -- as all of them are not your typical customers. I usually drill down to my town and (sometimes) a nearby town. Something to keep in mind here is the default setting on this ad type is to run continuously -- so if you set a budget of $10 per day it will run until you tell it to stop! I'd advise letting it run for 4 to 5 days at a time -- so you can judge whether it's working or not, and kill it if it's not. 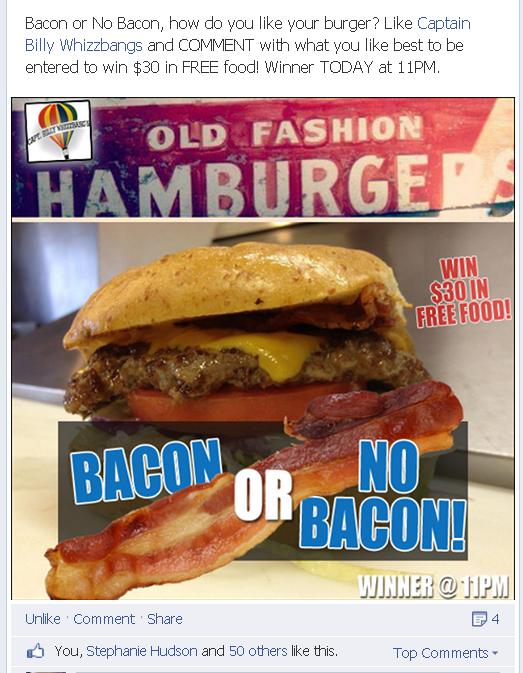 I'm a HUGE fan of contests on Facebook pages -- especially for local businesses. People dig winning stuff & dig it more when they can redeem it locally & immediately. As you may know, Facebook lightened the rules of contests on pages some time ago so now you don't need to run a contest on an app -- which can be challenging & time-consuming for small businesses. Instead you can simply post a text update with a contest & you're all set! Or post one with a photo. Whizzbangs gives us another great example of this with a post made at the same time I'm writing this! This is a great Timeline contest because it appeals to their fans' senses. And within minutes it had 50+ likes! Also notice that instead of just saying "Get a free lunch", they're giving away "$30 in Free Food". This puts a value on the prize -- and also will encourage customers to spend more when they come in, since they'll likely bring a friend or two with them. And even if you don't win the contest, your mind still just triggered your taste buds -- and now you want a burger! Where will you go to get that burger? Probably Whizzbangs if you're in the Waco, Texas area! At least that's what they hope you do! 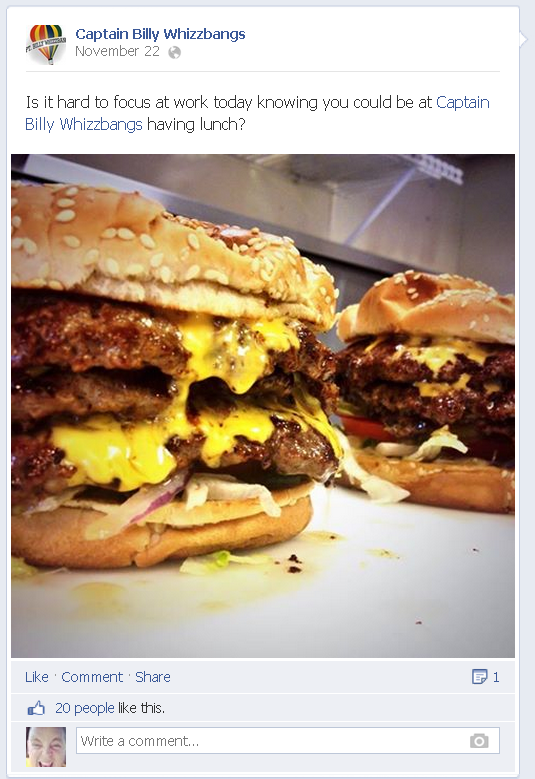 I'm a huge fan of the Boost Post feature on local Facebook pages. Could you get better results by using more powerful ad apps -- like Power Editor or Facebook Ads Manager? Maybe. But as a small business owner you don't need to waste time on those things. You're probably only going to spend $20 to 50 per month on ads -- and you don't need to get bogged down in advanced tools that just make numbers geeks giddy! Boosting a post is simple. Yes, there are quite a few options here. I typically will choose my local town as the target -- and then choose the age & gender. You'll then choose a budget for the ad, which depends on what you're willing to spend. Then click "Boost Post" and you're done. This will create a "Sponsored Story" in the news feed of the people you targeted -- which looks natural & non-intrusive to most people. 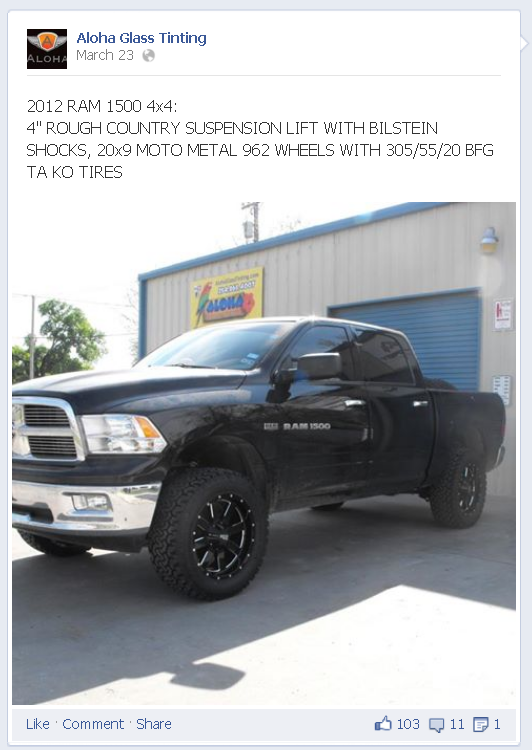 Do Boosted Posts for local businesses work? So I spent $5 to boost this post. 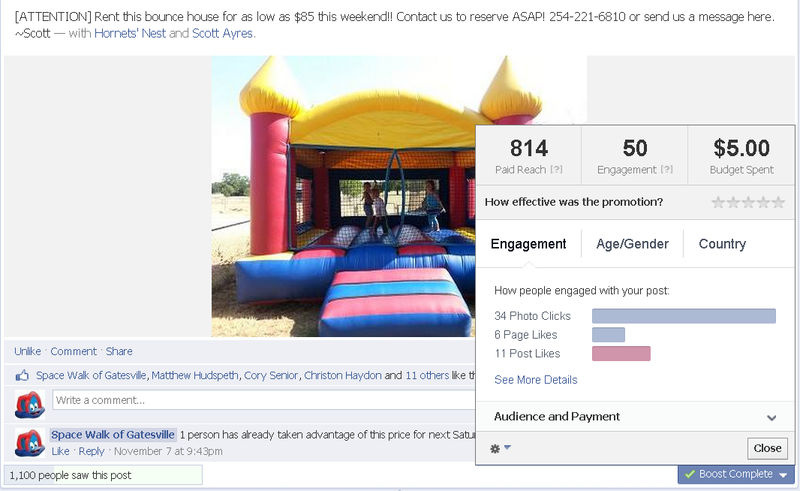 This $5 helped me reach 814 out of the 1,100 people who saw it -- (the page had about 200 fans at the time of the post). 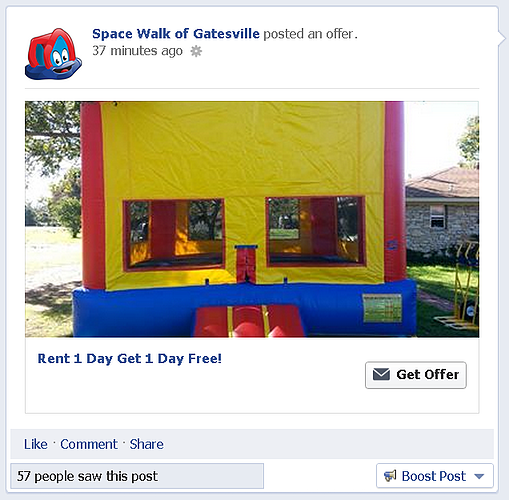 The post resulted in 6 new page Likes and (most importantly) 1 new rental sale -- which will net about $100! Not a bad return on a $5 ad spend! (most importantly) 2 rentals that will net me more than $200! Again, a great return on ad dollars at a local level. The other great thing is that both of these examples resulted in new Likes for my page -- which means more potential business later! In addition to being able to boost a post on the post itself, you can also do it from the Admin Panel above your cover. This comes in handy when you see a post is performing well & want to give it a bump in the news feed. 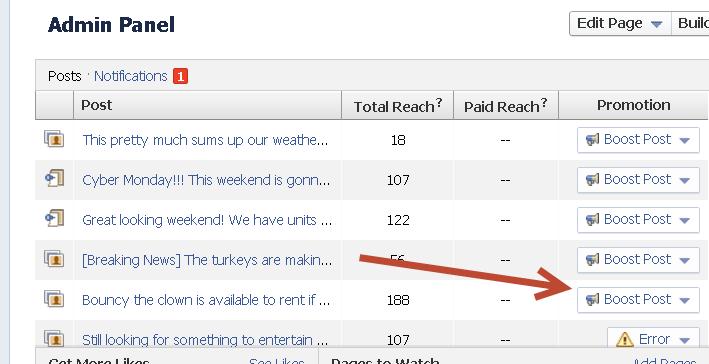 I know Facebook ad experts like Jon Loomer, Mari Smith, Dennis Yu and others don't recommend boosting posts. I have to respectfully disagree with them. And I think they're not helping local biz page owners by saying this. 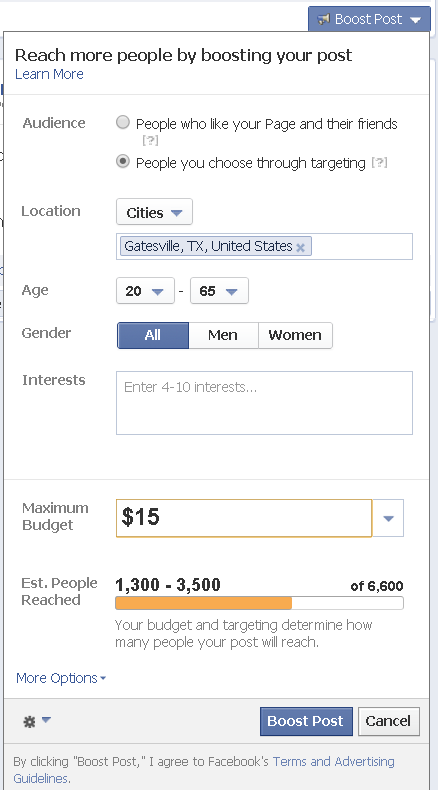 Yes, for large pages & companies, it makes more sense to use Power Editor -- but in reality those companies are better suited to hiring out for their Facebook ad management. But for a local business that will never have more than 1,000 fans, hiring someone to run your ads or bogging yourself down learning Power Editor or Facebook's Ad Manager is overkill, in my opinion. Trust me -- you'll get almost the same results by quickly boosting a post as you would spending hours picking through nerdy stats in the Power Editor! In the old days of marketing, what did every print, radio & TV ad have? Sure, the medium may have changed, but the necessity of customers being able to contact you has not. Make sure the messages feature on your page is turned on -- so people can send you a message quickly & easily, either on their computer or mobile devices. For my local page, I can't count how many times people have asked about pricing via messages -- and I've closed the sale right there! So fan page messages are a crucial feature for local businesses. People don't care about your email address -- they want to message you directly from your page -- or call you. To turn on messages on your page, go into your admin panel (above your cover photo) and click on "Edit Page" then "Edit Settings"
Click on the "Messages" area, then allow messages & click Save. Now any user on Facebook can send a message to you via your fan page. As a local business, you MUST put your phone number in the About section. Period. But you should also include your phone number when you create a post. Remember that 99% of fans will only see you in their news feed -- not on your timeline. So make it easy for them to call you from there. 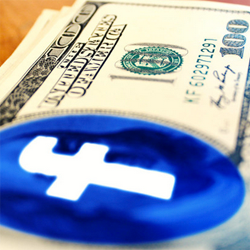 Facebook Offers are another great way to increase your sales using Facebook. Unfortunately, they're no longer free to run on your page. But they can be a great way to offer a discount or time-limited incentive to your fans & their friends. To redeem the offer they'll need to come into your store -- thus spending money! 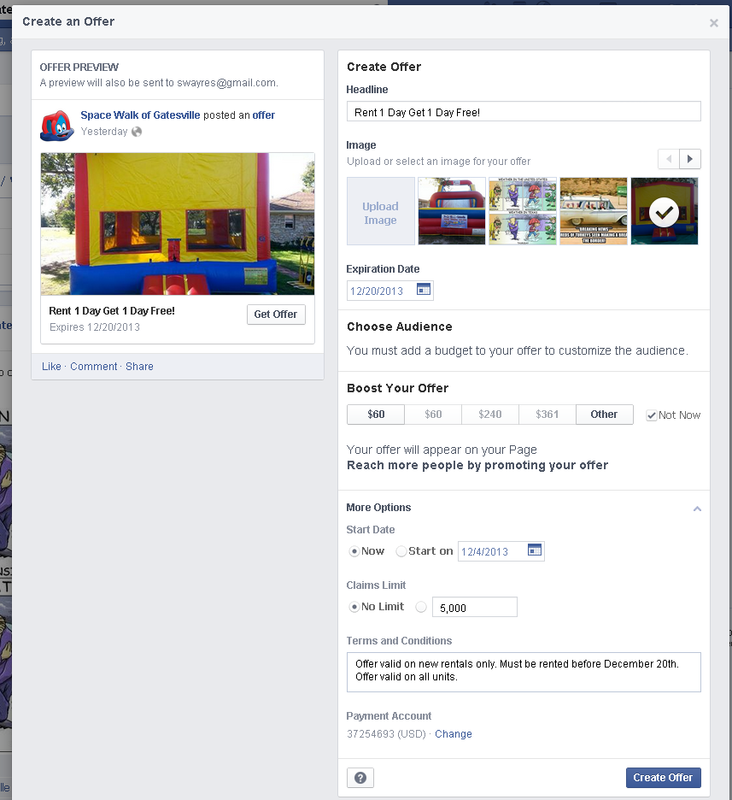 You can run an Offer directly from your page's Publisher -- where you normally post status updates. 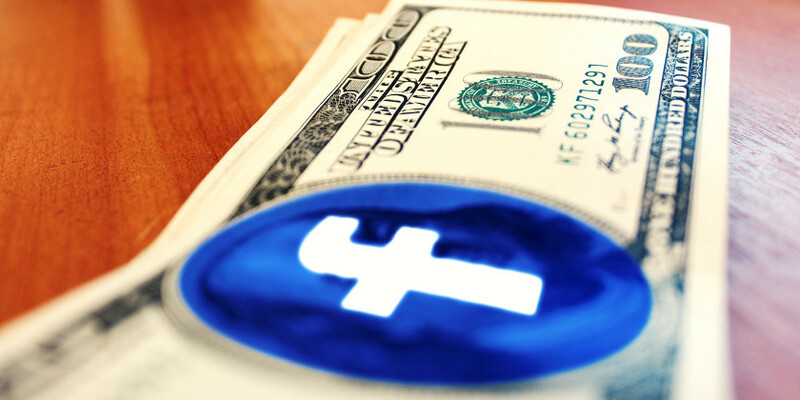 If you don't choose to pay to promote the offer, you won't be able to choose a target audience -- and the Offer will simply post to your Timeline. Also remember that if you choose "Not Now" -- meaning you don't want to spend money promoting -- the post will NOT show up in the news feed of your fans. It will only show on your Timeline -- which doesn't stop you from promoting it later, if you decide to do that. Make sure to add in the Terms & Conditions of your Offer -- and then click "Create Offer". For local businesses, Offers are awesome because, once claimed, they send users an email instructing them to visit your location to redeem the Offer. Thus driving more traffic into your store -- and increasing your sales! If you run a local business, I hope I've convinced you to start using Facebook to increase sales. By leveraging these 7 simple techniques, you're well on your way to making your local business a powerhouse in your area. Do you have questions or other proven techniques for leveraging Facebook for local businesses? Let me know in the comments below.